To travel between cities less that 1500 km apart, a bullet train in a low pressure tube is the safest, fastest, and most efficient option. (beyond that distance, supersonic air travel is likely faster & cheaper). Current transport (rail, road, water, air), are either slow, expensive, or both. Hyperloop is both fast and cheap. It is being developed as an open source project. The Hyperloop sends capsules through a low pressure tube. The capsules are supported by a cushion of air, and are accelerated via magnetic linear accelerators. Passengers enter and exit Hyperloop at stations at the ends, or at branches along the tube. 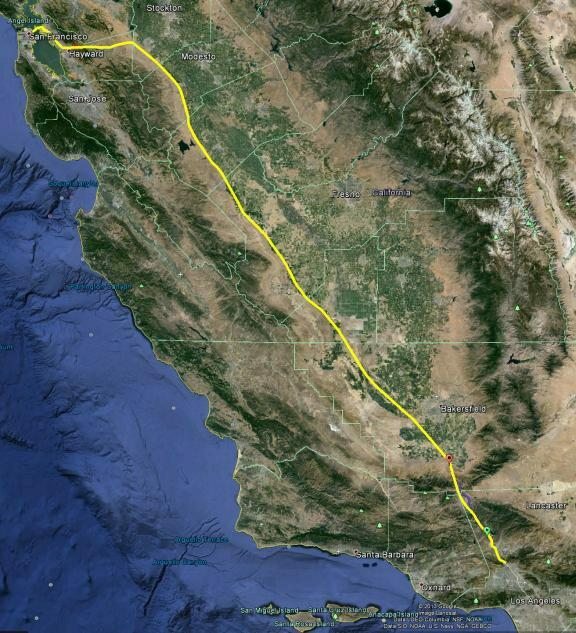 This study presents the preliminary design for a Hyperloop between Los Angeles and San Fransisco. Total trip time is ~30 min, with capsules carrying 28 people running as often as every 30 seconds. Cost is projected to be $6 billion dollars, which (amortized over 20yrs) amounts to ~$20 plus operating costs per one-way passenger ticket. 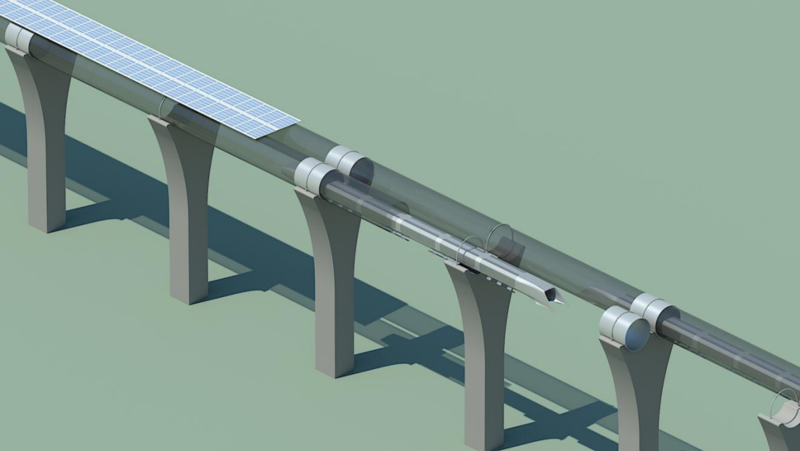 feedback to hyperloop@spacex.com or hyperloop@teslamotors.com. This is a Gingko tree summary of the “Hyperloop Alpha” document (PDF). Gingko App is still in development, and we hope to be able to offer more than three levels of depth eventually. Hyperloop is a mass transit system that’s reliable, affordable, and fast. The system consists of “capsules” containing passengers, which are propelled down a low-pressure tube. The capsule is suspended by air cushions, and the tube is above-ground. Around 28 passengers per capsule will be carried at 480kph (in urban areas) and at 1,220 kph along the Interstate. This design specification captures all the main challenges with each component, and proposes solutions for each. Rand Corporation and ET3 have also proposed a hard vacuum system, with electromagnetic suspension. The challenge with this approach is the extreme difficulty of maintaining vacuum in a 700 mile tube with dozens of gateways, and thousands of pods entering and exiting daily. The main challenge for a capsule moving down a tube, is the air in front of it. If the tube is too narrow, air cannot flow around the capsule, and it behaves like a syringe. This can be overcome by placing a compressor fan at the front, which also provides air for the suspension cushion underneath the capsule. Other challenges include cost, earthquakes, thermal & geological expansion/contraction, and energy considerations. Ideas for overcoming them are presented. In fact, for energy considerations, placing solar panels on top of the tube can generate far more energy than the system requires. The capsules will carry ~28 people, for a capacity of 840 passengers per hour. The system will need 40 capsules during rush hour, 6 of which will be at the terminals for loading/unloading passengers (~5 min). (two versions of the capsule are proposed: passenger only, and passenger & vehicle. Design parameters for both are presented). The tube will be at a pressure of 100 Pa (0.015 psi). This pressure is low enough to reduce drag, but not so high that it requires complex industrial vacuum pumps to maintain. The tube will be elevated on pillars, to reduce footprint & land requirements. Accelerate capsule from 0 to 480 kph. Maintain capsule at 480 kph as necessary, (including during slope ascents). Accelerate the capsule from 480 to 1,220 kph at 1g. Decelerate the capsule back to 480 kph at end of coasting section. Hyperloop uses a linear induction motor to accomplish this. 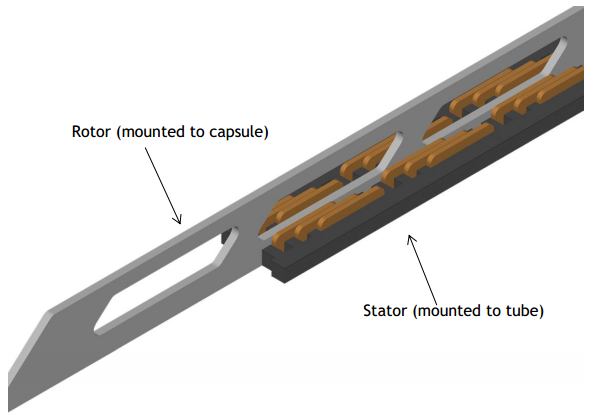 The capsule will contain the ‘rotor’ part, while the tube contains the ‘stator’ part. Hyperloop will allow LA to SF travel in 35 minutes. Optimized location of linear motor tube segments. Geography (urban, mountain, parks, airports, etc). The capsules will travel at 480 kph where geography requires many bends (start/end), and at 1220 where the route is straighter (mid section, along I-5). In many cases, Hyperloop is intrinsically safer than airplanes, trains, or cars. Hyperloop is an integrated system; everything from the vehicle, propulsion system, energy, timings, and route, are controlled. The system is immune to weather. The propulsion system is integrated into the tube sections and is incapable of accelerating the capsule to speeds that are unsafe for that given section. With weather & human error removed from the system, few safety concerns remain. Total cost is < $6 billion for the passenger only system. (passenger + vehicle would cost $7.5 billion). A high speed transportation system known as Hyperloop has been developed in this document. The work has detailed two version of the Hyperloop: a passenger only version and a passenger plus vehicle version. Hyperloop could transport people, vehicles, and freight between Los Angeles and San Francisco in 35 minutes. Transporting 7.4 million people each way and amortizing the cost of $6 billion over 20 years gives a ticket price of $20 for a one-way trip for the passenger version of Hyperloop. The passenger plus vehicle version of the Hyperloop is less than 9% of the cost of the proposed passenger only high speed rail system between Los Angeles and San Francisco. Hyperloop is considered an open source transportation concept. The authors encourage all members of the community to contribute to the Hyperloop design process. Iteration of the design by various individuals and groups can help bring Hyperloop from an idea to a reality. including attitude thruster or control moment gyros. and passenger plus vehicle versions of the Hyperloop capsules. The maximum width of the capsule is 1.35 m, the max height is 1.10 m. The overall weight is ~3100 kg. Total cost should be no more that $245,000. The frontal area is minimal, and streamlined to reduce drag. The compressor at the front ingests oncoming air. Aerodynamic simulations support the ‘compressor in a tube’ concept. Simulations support the validity of the ‘compressor within a tube’ concept. Comfortable seats that conform to the body are important due to the high accelerations. Landscapes will be displayed in the cabin, and passengers will have personal entertainment systems. The total cost of the interior for a passenger-only model should be no more than $255,000. The onboard compressor serves two purposes: 1) to allow the capsule to move through the tube without choking the flow of air around the capsule. 2) To supply air to the air bearings that support the weight of the capsule. Further details on the compressor, including schematics, can be found in the original PDF. Summary: The suspension behaves like an air hockey table (except it’s the puck that creates the air cushion). Suspending the capsule within the tube is a challenge, due to transonic crusing velocities. Magnetic levitation is a viable solution, but the construction costs are prohibitive. Air bearings suspension offers stability and low drag, at feasible cost, by exploiting the ambient atmosphere in the tube. Externally pressurized air bearings are suitable, due to the high stiffness required to maintain stability at high speeds. When the gap between ski and tube shrinks, the flow field pushes back strongly. This stiffness is superb for reliability and safety, but in order to account for passenger comfort, must be paired with an independent mechanical suspension for a smoother ride. Each capsule will have 28 air bearing skis that conform to tube walls. Each will be 1.5 m x 0.9 m, floating on a pressurized cushion of air 0.5 to 1.3 mm off the ground. (pressurized relative the environment… peak pressure is only 1.4 psi or 9% of atmospheric). The passenger capsule power system includes an estimated 2,500 kg of batteries to power the onboard compressor and capsule systems in addition to the compressor motor and coolant. The battery, motor, and electronic components cost is estimated to be near $150,000 per capsule in addition to the cost of the suspension system. Cutaway of the tube system. Tube is suspended above-ground to minimize land requirements.